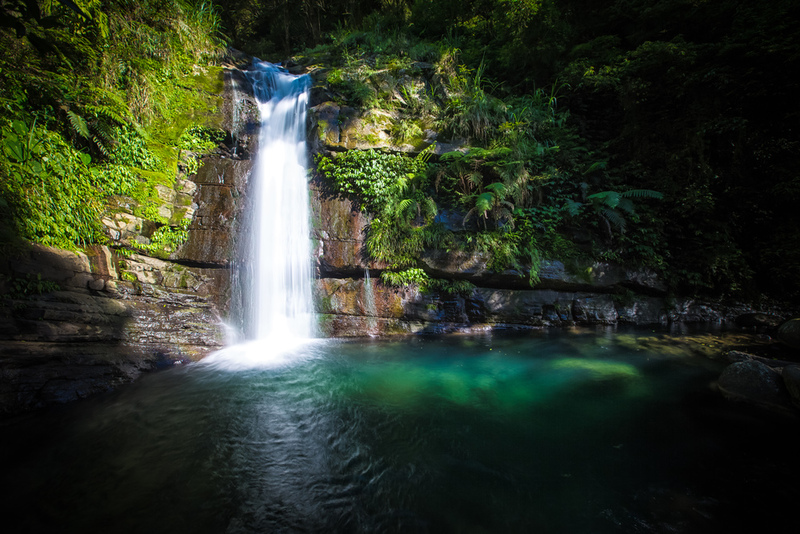 The Yuan-Yang Valley (鴛鴦谷) is set within a National Forest Recreation (國家森林遊樂園) area and is rich in hiking trails, beautiful waterfalls and rivers. The park is just outside of an Atayal Indigenous village in Hsinchu's mountainous and extremely picturesque Jianshi village (尖石鄉). The valley is a short, yet beautiful drive from Neiwan (內灣) and is close to a popular camping ground situated within the small indigenous village. There is a lot to do within this forest park, but I'm going to focus on a few of the waterfalls found within and post only photos of them. 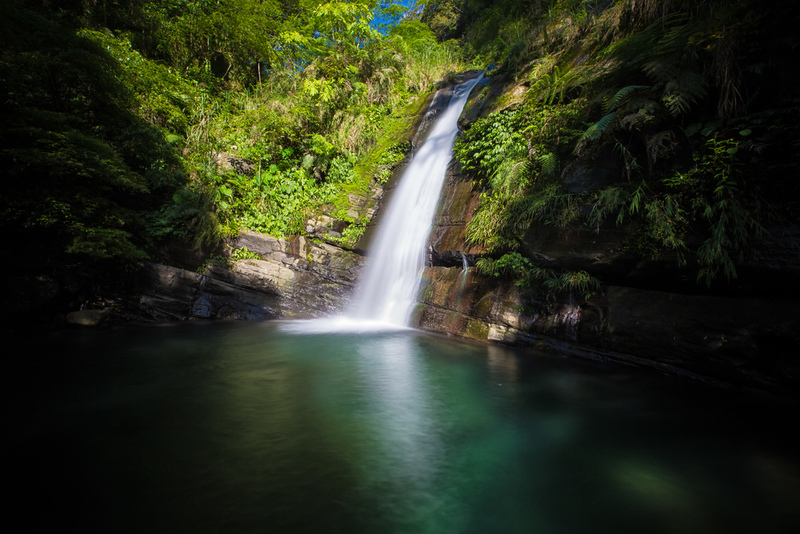 The park has several hiking trails and while the spectacular waterfalls might be the major attraction, there is still a lot for me to explore in this area and I'm eager to get back to hike some of the trails within. From the entrance to the park, the waterfalls are a short hike up a paved mountain trail from a trailhead that is just past the village. The trailhead is blocked for cars, but you can easily get a scooter in and drive up to the falls if you're feeling lazy. The two main waterfalls are not very far from each other but oddly there is a sign along the path that indicates the entrance to a waterfall for one and not the other. This trail is developed quite well while the trail to other requires a bit of bravery to get to it. If you haven't come prepared for a hike (or River trace) it might be best to skip the much larger waterfall and keep hiking towards the second which is on a safer path. To get to the first waterfall on the trail you have to have a keen eye and watch the road as someone has spray painted in red ink "Waterfall #1" (瀑布1) on the road with arrows pointing to a small path that goes directly off the road. The marker is easy to miss because the road is often covered in foliage. I completely missed it the first time, but truthfully the first time I visited I had no idea that there was more than one set of falls. Waterfall #1 has several tiers and the water you're likely to see flowing down the falls isn't like what you'll see at the other set however the sheer height of the falls and the fact that it has several tiers makes it much more beautiful than the other set. I estimate that it is about 40 meters tall making it considerably larger than Waterfall #2. It isn't that easy to get very close to Waterfall #1 and it seems like it is best viewed from a distance. 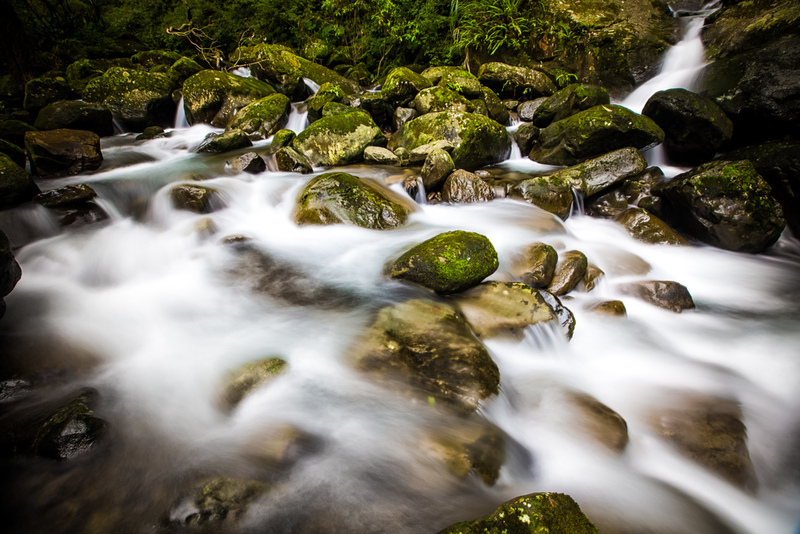 If you plan on getting close to it, you're going to have to have river tracing shoes and be prepared for wet, slippery rocks that are dangerous. It's possible to get up close and personal with it, unfortunately the day that I went it called for rain and as I was crossing the river it started, so I didn't try to climb up on the rocks. Waterfall #2 is about a one hundred meter hike from the trailhead to the first set and sits on a much more developed trail than the other. No ropes are necessary and it is a short two minute walk from the road to the falls. When you arrive at the falls you come up to a viewing platform where you can see the falls from a distance. There are warning signs that swimming is not permitted and I'm not going to recommend you go for a swim, but I'm pretty sure I would have if I wasn't carrying a bunch of photo equipment with me. To get to the base of the falls you need to be really careful and jump over the rail at the viewing platform to walk down a small hill. I have to say that if you choose to check out the falls at base level or go for a swim that high you have to be really careful and make sure you're wearing proper footwear. It's not likely that your cellphone will have service in the area so if an accident happens you're not in the best situation. Apart from the two major waterfalls within the park, there are actually several waterfalls within the valley and while heading back to the trailhead I noticed serval more large sets of falls in the distance on the other side of the mountain. I'd really love to find out if there are any river tracing groups that are familiar with the area because there is so much more to see than these two sets of falls. I find that these waterfalls (and the forest park as a whole) are under-appreciated and not many people visit them, so I hope that if you're in the area you should definitely check them out. The valley is beautiful and there is some pretty awesome scenery to be found within the park. If you like camping there are great campgrounds in the indigenous village near the falls and if you know anything about Taiwan's indigenous peoples you're sure to have a great time if you hang out with them for a weekend! The drive to the waterfalls through Jianshi is absolutely beautiful and it's only about a 20 minute drive past Neiwan. 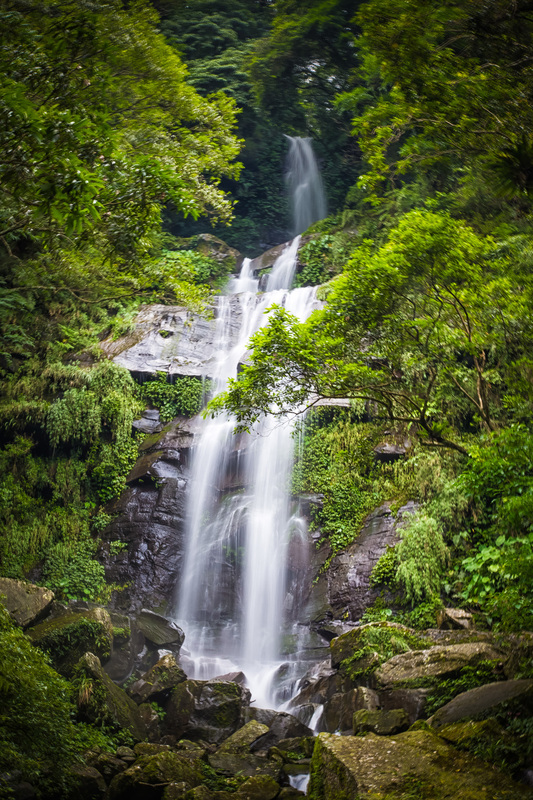 There is lots to do in the area so if you're looking for a great day trip you might want to start with these falls then check out some locations in Jianshi and then end the day in Neiwan for some dinner on the old street.